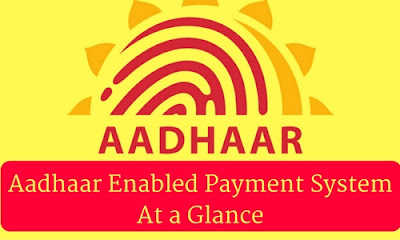 Aadhaar Enabled Payment System is a major initiative taken by Government of India to initiate a simple, secure user friendly mode of payment solution by Micro-ATM. It also empower Cashless Economy in the country in future. The basic meaning of AEPS is a customer can pay through Aadhaar Card, i.e. Empowering Cashless transactions in the country. Through Aadhaar Card a customer can access his/her bank account. However, these days Government of India is also trying to empower bank customers to use Aadhaar as his/her main identity to access his/her respective Aadhaar enbled bank account and perform various transactions like balance enquiry, cash deposit, cash withdrawal, Pay through Aadhaar, etc. IIN (Issuer Identification Number) – It is the Identification number to recognise the Bank to which the customer’s banks account is associated. Aadhaar Card Number – It is a 12 digit unique identification number provided by the Gov. of India at the time of enrolment. Finger Print – A customers need his/her finger print which was captured during their enrolment. NPCI (National Payment Corporation of India): It was founded in 2008, Headquarters at Mumbai, It is the umbrella organisation for all retail payment systems in India, which aims to allow all Indian citizens to have unrestricted access to e-payment services. NPCI conducts all government benefits/subsidies to beneficiary account in a secured and transparent manner. It also provides a unique platform to use safe and secure payment interface to avail those benefits by using their finger prints. NPCI is directly in touch with Unique Identification Authority of India to provide Aadhaar Enabled Payment Service to reduce the forgery in Indian Financial System. Let us understand by using flow chart. I Hope it will clear everything. But here I will describe the following steps. Step 1 – Customer swaps his/her cards at Mini ATM. Step 3 – Customers bank get confirmation from NPCI. Step 4 – NPCI get confirmations from UIDAI. Step 5 – UIDAI approve confirmed details about customer Account to NPCI. Step 6 – Again after getting confirmation from UIDAI , NPCI again asks Creditors details to his/her banks. Step 9 – SBI deduct the amount which customers want to pay/credit. Step 10 – Now customers get confirmations bill from Mini ATM. Aadhaar enabled Payment platform is a very important tools to rule out all the fake data in the system concerning National Social Assistance Programme (NSAP). The basic theme of Direct Benefit Transfer is to ensure that the beneficiary gets their benefit through Aadhaar Enabled Payment System (AEPS) which is an accountable, cost-effective and transparent.